Welcome to the Quilting Business Blog! Welcome to the Quilting Business Blog! 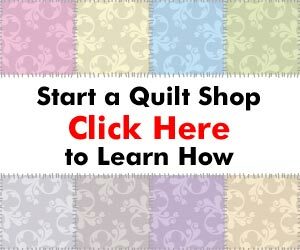 This blog is a resource for anyone who is involved (or hopes to be) with quilting as a business. This includes quilt shop owners, anyone offering a quilting service, quilts for sale, long arm quilting services, quilting classes or any other types of quilting business. If you are brand new to the industry, you will find lots of articles and resources that relate to starting, and running a quilting business. Small business is something I am personally very passionate about, and it is my goal that by reading this business blog and implementing the tips and advice you find here, you will see improvements in your business that speak to your bottom line. I believe everyone needs a business coach, and that is exactly what I intend this blog to be, your personal business coach. Now, let’s start making some money! thanks Charlotte and welcome to the quilting community. I look forward to hearing more from you! I was advised by my son to go to the Go Daddy! website to obtain a domain name … the website also includes a template to build a website in very little time and the cost is included in the price of the domain. It was very easy but also very basic but I have a website now announcing the opening of my longarm quilting services this fall. I have a lot of work to do to make it functional, but it’s a start! While GoDaddy can be a good solution for some people, keep in mind that using a WordPress blog as a basis for your website has huge advantages of a regular website. Using WordPress allows you to EASILY add new content to your site. Google loves WordPress sites because of this, so it is generally much easier to get traffic from Google by using this method. Previous post: Thank you for all your comments, questions and encouragement!